Diversity consultant Gilo Kwesi Logan speaks during a discussion in February. Logan was among five panelists who discussed the importance of history as it pertains to the future of the Evanston black community Saturday night. A film and panel explored the history of Evanston’s black community Saturday, touching on progress that has been made and where change is still needed toward racial equality. The documentary, titled “Evanston’s Living History,” played at the Unitarian Church of Evanston. 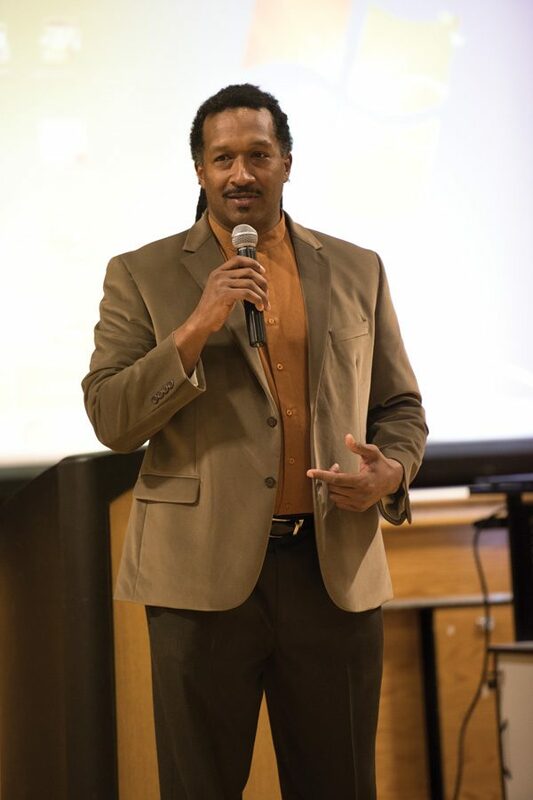 The film was accompanied by a presentation about the early history of black Evanston residents by Dino Robinson, the founder of Shorefront Legacy, a nonprofit that documents the history of the black community on the North Shore. The panel also included Robinson, film creator Craig Dudnick, Rev. Michael Nabors from Second Baptist Church in Evanston, and Ra Joy, the executive director of CHANGE Illinois. The film, which was created in 2008, recounts the history of Evanston’s black community, told through stories from elderly residents who lived through segregation in the city. It also featured descendants of those who moved to Evanston from the South after the lynching of Anthony Crawford, a businessman in South Carolina and the patriarch of a few descendants who moved to Evanston. Dudnick was inspired to make the film after the death of a close friend, Viola Hillsman, who he met while working in a Northwestern fraternity kitchen. Years later, Dudnick moved in with Hillsman after her husband died. “There’s some people that just totally change your life, and she had that effect on me,” he said during the event. The film also laid out the achievements of several prominent black Evanston residents, including Edwin Jourdain, the city’s first black alderman, former police chief William Logan, former fire Chief Sanders Hicks and former mayor Lorraine Morton. Despite their success, these leaders discussed in the film the discrimination they experienced. Hicks, who became Evanston’s first black fire chief in 1980, said in the film that although he was mistreated in his early days in the fire department — including being issued an ill-fitting uniform and getting his lunch stolen — he was determined to continue serving in the department. “I always thought about if they do it, I can do it,” he said. Logan, who has worked for the city as a diversity consultant for the police department, said the film conveyed the importance of history in the Evanston community. Evanston resident Michelle Kemp said she came to the film to learn more about the history of the city. Rep. Robyn Gabel (D-Evanston) attended the screening, telling The Daily that she is always interested in learning more about Evanston history. “It’s always surprising to have the discrimination here shown to you in such a direct way,” Gabel said. The panelists also discussed the steps that have yet to be taken in dismantling racism.